Valley Ridge Farm is pleased to provide a sampling of the testimonials we have received from our valued clients over the years. As West Virginia’s premier equestrian educational, training, and boarding facility, our goal is to assist each individual by providing the same exceptional level of care and service that we have offered since we opened our barn doors 39 years ago. 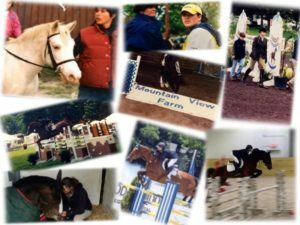 A Valley Ridge Farm Alum Perspective – “I learned how to ride at VRF starting at age 6 on Q tip, Babe, Banjo, and Joker. I remember some of my riding lessons from that time, and even some of the falls (my joints remember them too!) But that’s not what I remember most clearly. It’s the time spent with friends that became my family, chatting and laughing while mucking stalls, dumping frozen water buckets, unloading hay in 95 degree heat, bathing ponies, and cleaning lots and lots of tack. I learned to appreciate the amount of work it takes to be able to ride and care for these beautiful animals, all for the love of the horse. When I started competing, I learned about the ups and downs of the sport. I learned about sportsmanship. I learned how to pick myself up when I fall down, even if I am embarrassed. I learned how to take care of myself so I could help my horse perform. I learned about disappointment, and how to come back more determined and to fight for the ride I want. Later on, I learned what it takes to lose a friend too soon. Most importantly, I learned to keep learning from every situation life presents. This grit helped me excel in my professional career and forge my comeback to riding and showing after a nearly nine-year hiatus. This grit was instilled in me 25 years ago at VRF, along with a lifelong love of horses. And I’m forever grateful. “Valley Ridge Farm is a FANTASTIC place. I boarded my mare there for two years before we had to move back to New York. I didn’t want to leave. On riding/training: Trainer Michele is the most knowledgeable trainer I have ever worked with. She’s great at communicating with her riders, and fine tunes her explanations with examples to help you understand. She’s great at restoring and building confidence, and taught me and my horse Maggie a lot. She never pushed too hard and offers just the right amount of sternness to get the job done! I had great lessons every time and Maggie grew into an incredible athlete during her time there, and it was all thanks to Michele and the great riders she has there. If you want to become a great and confident rider, go with Michele. On boarding: Throughout my years of owning horses, I have been at four different barns. I can honestly say that VRF is THE BEST boarding experience I have had. I always felt comfortable with Maggie there. I never felt like I had to be at the barn to make sure she was okay. Maggie was always super healthy and very happy at VRF. I always knew she was in great hands with Michele and the staff there. They pay attention to each and every horse and develop a personal relationship. Maggie was treated like a queen by all the staff, riders, trainers, and boarders alike. On top of all this, the people at VRF are amazing. Everyone is very welcoming and non-judgmental. VRF is a warm and welcoming community and family of knowledgeable horse people who are serious about riding, horse health care, and happiness! “We have been at VRF for two years and I don’t know one person or family who isn’t THRILLED with their entire experience. Whether riding for the first time or finding a home for your horse, VRF provides superior riding instruction coupled with excellent horse care in an exceptionally clean and safe environment. Michele’s deep understanding of her trade and decades of experience is evident in every lesson. Her ability to naturally translate her profound depth of knowledge is specific to each rider, relative to their skill level. Each and every lesson has her undivided attention and commitment. When watching lessons, I’m always amazed at how technically consistent and attentive Michelle’s coaching is, whether the lesson is individual or if there are multiple riders in the ring. Is Michele a tough coach? You bet she is! And I wouldn’t want it any other way. She’s tough on her demands for safety both in and out of the ring, because the safety of each child and horse come first! Michele does not let the riders fall into bad habits or get sloppy or distracted. She is tough, fair and consistent and her riders improve dramatically as a result. Not only are these riders learning exceptional technical skills, but Michele’s style of coaching naturally influences her riders in many other important ways. She is building their character by instilling self-confidence, responsibility, etiquette, work ethic and individuality. She teaches her riders the proper respect of the horses as well as the correct methods and manner to properly care for them. She keeps an exceptionally clean stable and barn and demands the same of each rider under her care. Michele leads by example and demonstrates the lesson that anything worth doing is worth doing right. When my daughter began riding at VRF, I expected her to learn how to ride a horse well. What I didn’t expect was for her to learn these very important life lessons that are so positively shaping and developing her character! “My daughter and I have been at Valley Ridge Farm for over a year now. We initially came so that my daughter could participate on the Interscholastic Equestrian Team. It wasn’t long before we decided to make VRF home to our horse, too. The barn is well run and I am always confident that my horse is receiving quality care. Although the board is higher than where we were before, there is really no comparison in the facilities and level of care, so I don’t even have to question the difference in cost. My horse’s stall is always clean, and he is seen regularly by the farrier. I don’t have to worry about his needs and I know he is in good hands. My daughter has made so much progress in such a short time at VRF. Her trainer is very experienced, knowledgeable, and professional. She coached at the collegiate level for over 25 years, and has been a coach and trainer for over 30 years. It is obvious that she has a passion for what she does. My daughter has ridden many different school horses, and learned something new from each one. Every school horse in this barn has proven himself to be a valuable asset to the training program. The trainer knows the personality of each school horse, as most of them have been here for years, and she selects the appropriate horse for each rider’s ability and skill level. My daughter has worked her way up from the beginner horses to those appropriate for more advanced riders. After watching my daughter for a year, I decided to take lessons myself, something I always wanted to do when I was a kid but never had the opportunity. It has been a great experience and I am looking forward to many more years sharing this wonderful sport with my daughter. My daughter participates in the working student program at VRF. She works an eight-hour Saturday and earns a free lesson. She is learning responsibility, team work, leadership skills, organization, and time management, in addition to equine care and barn management. The best part is, she doesn’t see it as work, because she loves spending time at the barn, and so do I.